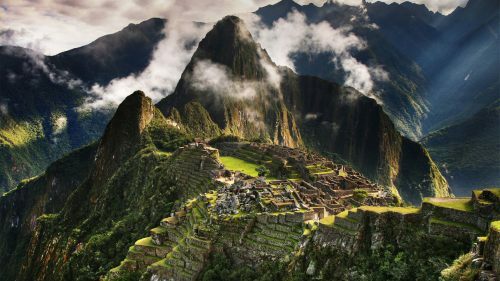 Aeromexico has dropped the price of their April and May flights from Vancouver to Lima, Peru down to $548 CAD roundtrip including taxes. The flights have about a 2.5 hour stop in Mexico City on the way there, and just under 5 hours on the way home. 3. Click through from Momondo to the booking site showing the cheap price (GoToGate). 3. Click through from Momondo to the booking site showing the cheap price (Expedia). If you click on 'More' you can choose to book with Expedia. Update 3/22 - Vancouver to Lima, Peru flights for $548 CAD roundtrip including taxes have returned today. Most of the summer dates have a long layover on the way there. You can also usually find similarly priced flights to Quito, Ecuador (UIO) or Medellin, Colombia (MDE) or Bogota, Colombia (BOG) on the same dates. Also be aware that Peru is currently experiencing some terrible floods. 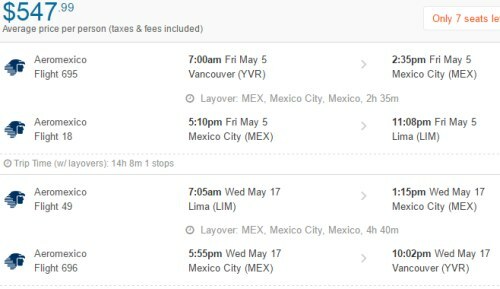 6 Responses to "Vancouver to Lima, Peru - $548 CAD roundtrip including taxes"
Hi Chris, we love your site and the flight deal notifications. However we just tried to find the just added April flights and the price we found for one person was almost double. What are we doing wrong? Are we simply too slow? Yes, unfortunately these Aeromexico flights returned to normal prices yesterday. I will definitely keep an eye on them let everyone know if they drop again. Is it possible that the flights will drop again during May or is it highly unlikely? While it's impossible to say for certain, I wouldn't put it into the 'highly unlikely' category. Aeromexico has dropped their prices to Lima before, and a past price drop does increase the odds of it happening again.